Taste test: Thin and crispy are good words to describe these chips. They also had a very strong pickle flavoring, packed with green flecks and flavor powder. They tasted like chips dipped in pickle juice, that's for sure. There was a slight salty taste as well, and it took a little bit away from the pickle taste, but it wasn't too bothersome. These were a great value since we bought them for $1 at the Dollar Tree store. If you can find them you'll get a great bag of chips with a good pickle taste. 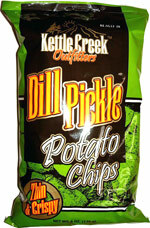 Smell test: A strong aroma of pickle wafts up when you open the bag.